Submitted by Dan Dooré on Wednesday, May 23, 2018 - 15:44. Basically Pac Man, though of course we’re not supposed to admit that. 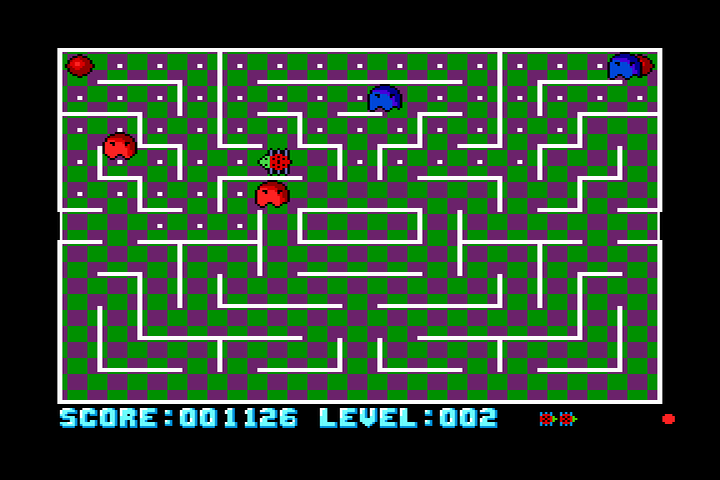 100 mazes with dots, ghosts and power pills; later on, one-way walls (which look the same as normal walls) appear which makes navigating the maze very much harder. Well, I bought Bulgulators at the last show, mainly because I like PacMan and also because of the extra features it boasts. In the original PacMan, you played the part of a small yellow tennis ball with a slit for a mouth, and two black eyes (not as in, smack! Ouch, I’ve got a black eye.). On each of the numerous and repetitive levels you had to negotiate a maze containing four ghosts intent on eating you. Whilst doing this you had to eat all of the dots littering the maze, and perhaps eating the Power Pills, these gave you the power to eat the ghosts for a while, until it wore off and the ghosts returned from their “blue” frightened state, whereupon the ghost that you thought you had time to eat would turn round and kill you. At the side of the screen there was a tunnel which you could enter and it would warp you to the other side of the screen, the ghosts could not follow you down this and so it proved a useful escape route. Also, from time to time, small, food-orientated, bonuses would appear in the middle of the screen to tempt you and increase your score. One other thing, the PacMan of the arcades had the occasional “cartoon” between levels. When I say “cartoon” I refer to a bit of mindless chasing about the screen rendered in poxy little graphics. (And I must say that The Bulgulators has captured the complete crapness of this event in side-splitting perfection). In case you are still wondering what the hell PacMan looked like, imagine Hampton Court Maze, littered with small plates of food, and an a very fat man eating them whilst being chased by four irate and spectral police-officers and you have just about got the idea. So, how does the Bulgulators compare? Well, it has several new features boasted on the back of the box, namely phantom walls, and doors that need keys to be collected before you can pass through them. It also has about a hundred levels, including bonus ones where you have a time limit, but successful collecting of all the dots rewards you with an extra life. One good feature is the inclusion of passwords every ten levels. This has prevented the game from being near-impossible. One bad feature is that I can currently get to level fifty, and have seen no sign of any phantom walls (this could be due to their inherent phantomness) or doors and keys. It’s all a bit repetitive though, I don’t blame the programmers (ESI) but it really is a stupid game to re-write, unless you are going to give it TONS of new features. Plodding around one hundred badly colour co-ordinated mazes loses it’s appeal really quick when you realise that they all play exactly the same. I really hate to be nasty to the game, as it is slickly programmed with some beautiful music (if rather poo graphics), but it really doesn’t cut the ice. Graphics 50% Bloik! Samey and too simplistic. Addictivity 67% Has an odd playabilty, not amazing, though. Instant Appeal 72% The promise of the new features is grabbing. Sound 82% Nice musical presentation, as always. Those blokes from ESI are up to their programming prowess again, but this time in the vein of at last writing games. So then, what is Bulgulators all about? Despite the mad name, The Bulgulators (let’s call it Bulg for spelling’s sake) is actually a jazzed up 90’s version of that popular classic, Pacman! This conversion is needed as SAM hasn’t got anything in the way of a Pacman game just yet, and this one is much improved on the 80’s classic! To make the game fit into the Ninities, the programmers have done several things to make sure it appeals to the computer generation we know and (ahem) love today. For a start, you can just about make out the white outline maze against the wacky backgrounds, and of course, the ghosts which faithfully turn blue when Paccy eats a power pill before they are swallowed and turn to a pair of floating eyes.As for Paccy himself, he has strangely undergone a metamorphisis into a…gasp!- ladybird from hell, which farts every time he is caught by a ghost (well, it sounds like farting…). But wait! There are some twists in the genre for Bulgulators. This includes the prominence of one way exits, two way exits on either side of the screen, and the frustrating doors which need keys to be accessed. The presentation is lovely, with some rather smart music, and there are 100 levels to chomp your way through, so it is rather lasting - increased even more by a password system, which looks easy to crack (only THREE letters - a few hundred or so possibilities!). The only problem here, though, is the background. Each level has a different background, and each level ensures that it is rather difficult to see the smaller pills. This makes some attempts of the game incredibly difficult as you wonder where the last pill is hiding. If there was a simple option to get rid of the ever-changing and sometimes garish background, this would get a higher mark. So then, in short, if you are still pining for Pacman after 10 years, then go ahead and get this to bring back the memories. Those sick and tired of puzzle games, but getting a little weary of unoriginal games on the Coupe (like I am) who want to have a few weeks of fun, get this! Submitted by Search: “samsneed4speed” on Tue, 2006-04-11 11:27. A pretty good game but after being teased by Encledeus’ demo of Mr Pac it was a bit of a let down, Mr Pac looked and played much better! It was faster and the music was well better! The actual finished product The Bulgulators is pretty slow and the music stays the same all the way thru! Surely more effort could’ve been put into the game??? 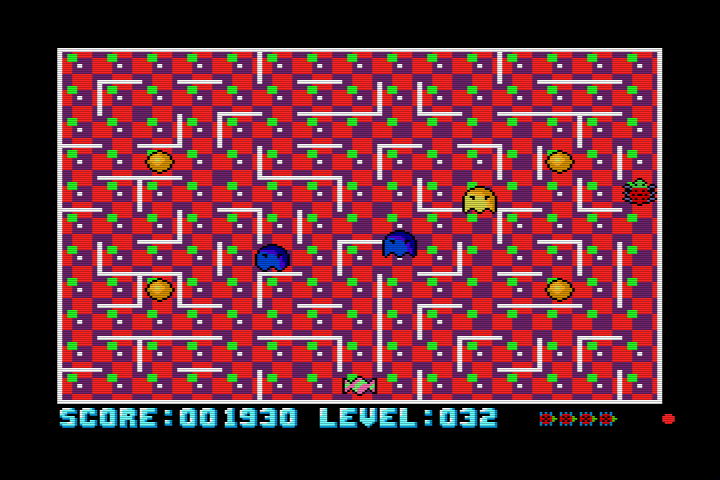 The levels get a bit silly too, I mean - who in the right minds gonna sit there and play 100 levels of Pacman? I wouldnt mind but the mazes get realy silly toward the end, this game should’ve concentrated more on variery and quality rather than loads of annoying levels, still - despite all the crisitism its worth having on your collection. There's quite a funny story associated with The Bulgulators. (Smirk smirk.) I saw an early version of the game, back when it was called Mr Pac, and it had rather a splendid set of tunes. They were the tunes from Pacmania to be exact. It seems Colin Macdonald was unaware they were copyright, and that Grandslam had just ripped the music off from the arcade game themselves. What an amusing misunderstanding, eh readers? I must submit it to the Radio Times and see if I can get on to the same thoroughly entertaining letters pages which brought us Mrs Gillian Nuttall of Rawtenstall and her hilarious childhood memories of 'The Borrowers'. Some sort of PS about David Jason will probably do the trick. But in the meantime, a few words about The Bulgulators. 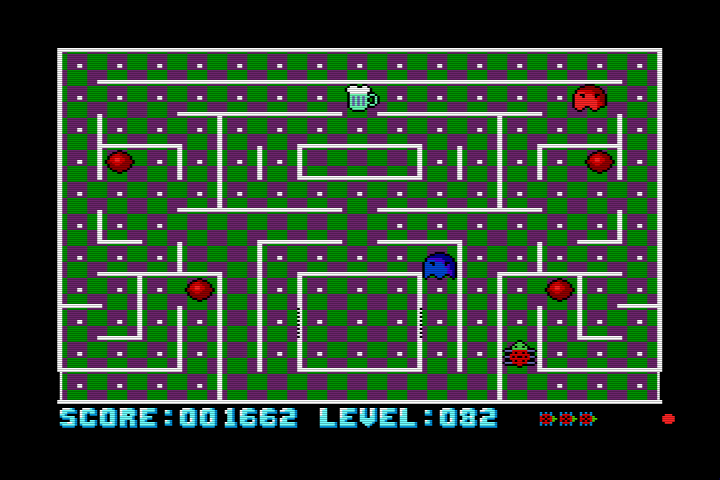 It's the first commercial game from erstwhile Speccy PD aces ESI , and it's a Ms Pacman game. There are one hundred levels and assuming there's a different maze for each level, one hundred mazes to navigate. (Bingo. Ed) The idea is, as ESI point out, 'as old as the hills' but for the benefit of Andy (who doesn't like to see huge blank spaces in his well-designed columns), here's a quick resume of the game style, made slightly more interesting by the employment of Nordic vowels. 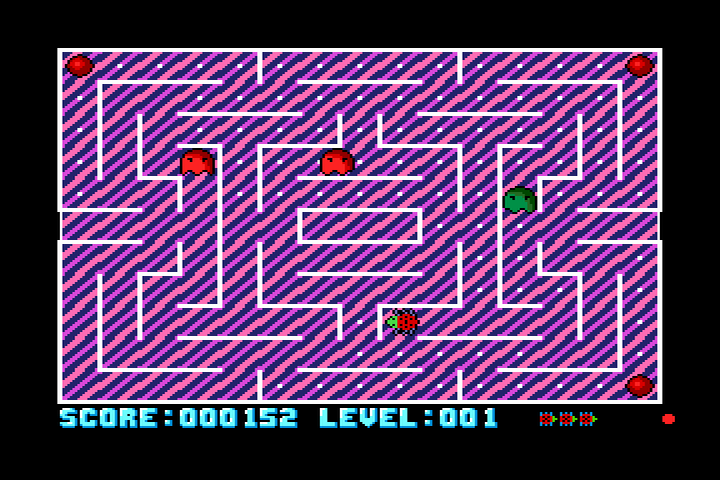 You have to eat all the dots in each maze, avoiding the ghosts. Eating one of the four power pills enables you to eat the ghosts for a bonus. Fruit also pop up to increase your score, and later levels promise one-way passages and locked doors. Hurrah, eh? 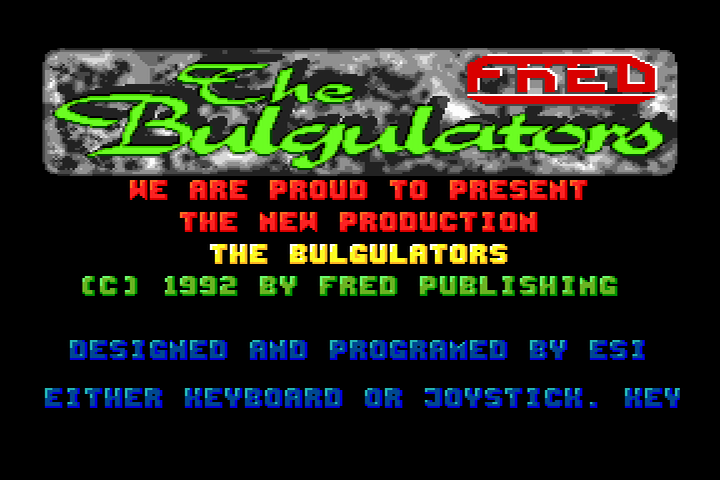 The Bulgulators hardly shows off the Coupe to full effect, but there's great use of colour and the sprites move very smoothly. Actually, on some levels the background colours are craftily chosen to make the dots blimmin' invisible (or as near as dammit) which adds an extra dimension to the gameplay and won't win ESl any friends. 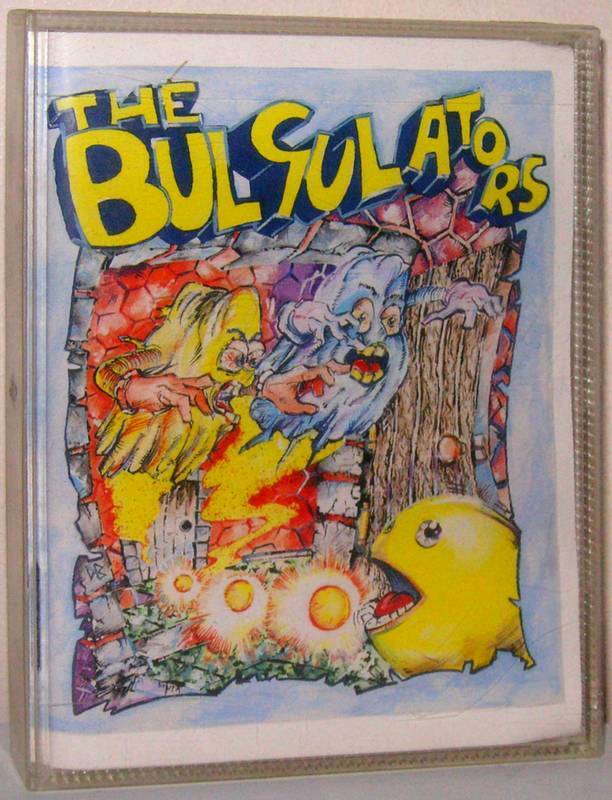 The Bulgulators is a highly playable game but one with a very irritating fault - the ghosts move randomly. Now any Pacman fan will tell you the point of the game is less about clearing levels than getting as many ghosts as possible with each power pill. (Erm, no. Several Pacman fans) I suppose that with one hundred mazes it's impossible to have predictable ghosts (indeed, some would argue that would take away much of the thrill of the chase) but it's terribly annoying to get caught between two of the blighters through no fault of your own and to have to ignore the ghost bonuses, instead using the power pills to frighten them away so you can clear more of the maze. Still, those fiends at ESI provide plenty of merriment with mazes stacked with dead ends and horrible open spaces, fruit that, erm, isn't (and kills you) and tunnels that don't come out on the opposite side of the screen. (Extremely nasty.) If I've a bone to pick with the actual maze designs it's that you never start in the same place twice, and a longer pause to find out just where the heck you are (trickier than it sounds with some of these backgrounds) would be very helpful indeed. So then - a playable maze game but one that misses the point about the power pills, is far too tough for the beginner and expects you to work miracles for those blimmin' passwords. Fun but very dated, and frustrating in a big way. The game was originally pitched as “Mr Pac”, with a yellow circular main character sprite, and music inspired by Pacmania and the Pac Man arcade game.